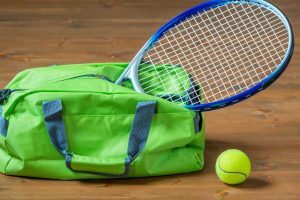 The best tennis shoes for you relies heavily on your needs and game preferences. The court surface material, your own playing style, and personal preference all impact which shoes will be best for you. When finding the best tennis shoes, there are a number of good brands to choose from. Each brand offers a slightly different set of advantages and disadvantages. This is why personal preference counts for so much. Although there are a number of price ranges to choose from, your personal foot and style are the most important factors. For instance, while some tennis shoes are best for people with wider feet, they will not be adequate for narrower feet. 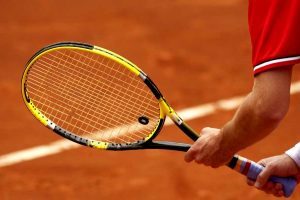 There are a number of great options for tennis shoes, but if you are playing a lot of games, you want the best. 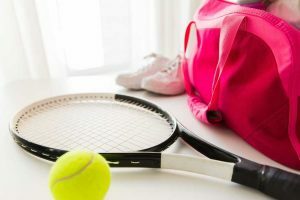 Following a few simple guidelines can help you choose the best possible tennis shoes for your individual needs. There are a number of contributing factors for which tennis shoes will be the best for you. While no two players have the exact same needs, there are a number of criteria that can help you choose the best shoes. The first consideration is what kind of court you play on. If you are playing on a hard court, you will need durable, cushioned shoes. 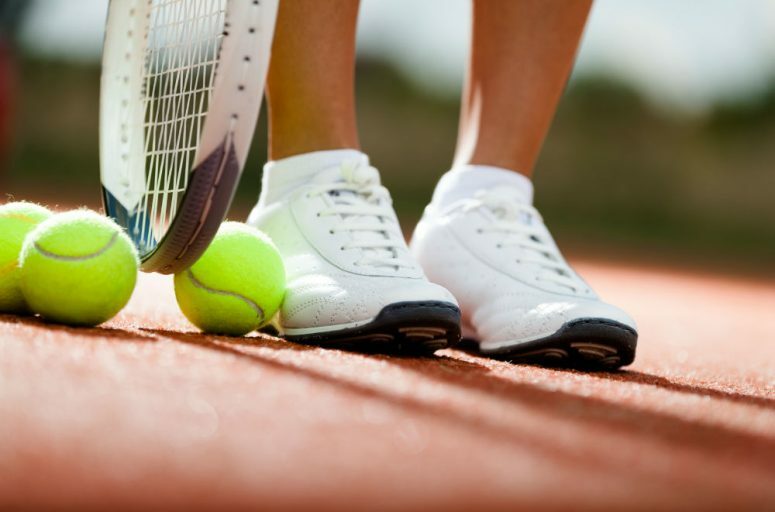 If you are playing on a clay court, you will need lightweight, laterally supportive shoes. If you are playing on a grass court, you will need plenty of traction. The second consideration is your particular foot needs. If you have higher arches, you will need a shoe with good internal support. If you have a wider foot, you will need shoes that can accommodate that. And, if you have narrow feet, you will need shoes that fit snugly. The third consideration is how frequently you play and for how long. Although you want your shoes to last regardless of your game time, you need to consider just how durable your shoes need to be. Finally, the last consideration to make is your price range. Tennis shoes can range anywhere from below $50 to over $200. Knowing what you expect to pay is an important step in the process as it will narrow your field of inquiry. As with many things, your personal tastes and needs will dictate much of what you are looking for in good tennis shoes. There are, however, some universal things to look for that should apply to all players. The first thing to look for in good tennis shoes is the supportiveness of the shoe. No matter what type of foot you have, you will need adequate support to keep you going during longer sessions. The second thing to look is the durability of the fabric. Sometimes you can tell this simply by the price tag, but you can also tell by reading the materials list. Leather is the most durable fabric, but it is also expensive and hot, so synthetics are more practical. Another thing to pay attention to is the weight of the shoe. Most players prefer lightweight shoes because you can focus on the game more and your shoes less. Additionally, lightweight shoes keep you from getting tired out before the end of the game. The final thing to look is traction. Some court surfaces, like hard courts, do have better traction in general. It is still important that your shoes also provide traction, however, so that you do not injure yourself while sliding for a ball. 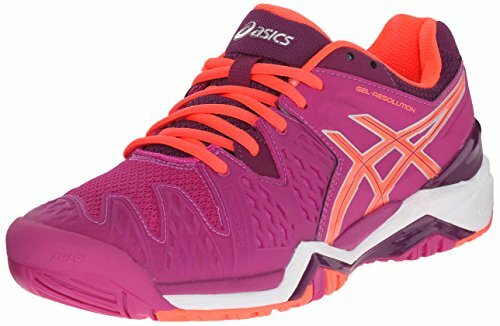 The ASICS Women’s Gel-Resolution 6 Tennis Shoes provide a good amount of comfort and stability, while still being flexible. Additionally, they do not require much break-in time, so you can be playing the same day you get your new shoes. The Gel-Resolution 6 tennis shoes are great for hard surface tennis courts since they provide ample padding. Despite the padding, however, the shoes are flexible enough for easy lateral movement. For tennis players with high arches who need additional support in their shoe, the Gel-Resolution 6 is comparable to a running shoe where support is concerned. While they do provide good support, though, they retain a lighter weight than many other supportive options. One aspect to keep in mind if you do have high arches, though, is that you will likely need to adjust the laces a few times. As the Gel-Resolution 6 tennis shoes are a bit stiffer than running shoes, people with a high arch need to adjust the laces to make the shoes fit properly. If you have narrow feet, the Gel-Resolution 6 tennis shoes will fit well. If you need the wider option, however, the shoe falls short. The wide option is barely wider than the regular, which can be a problem for some. The length of the shoe, however, is consistent with other brands and options. Although the foot bed of the shoes is cushioned and supportive, the top of the shoe can rub against your ankle. Depending on your choice of socks, the shoes can cause blisters on your ankles if worn for a longer game or practice. Wearing the Gel-Resolution 6 tennis shoes is a great choice for shorter practice and games, but the material does wear out over repeated uses. The toe box, as it is the narrowest spot of the shoe, is usually the first to go. 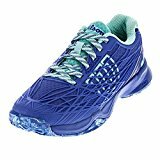 Overall, despite the some setbacks, the ASICS women’s Gel-Resolution 6 tennis shoes provide a great option for tennis shoes. 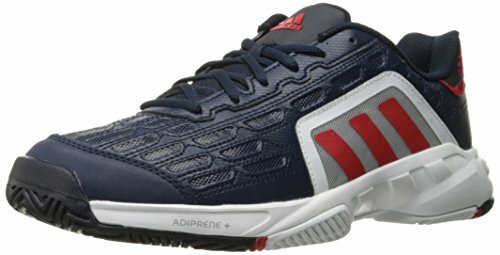 If you play on a hard surface court, or need the extra support, these are the best tennis shoes for your needs. The Prince women’s T22 tennis shoes provide a good lightweight and durable option for all types of court surfaces. Weighing in at under one pound, they are on the very lightweight side of the spectrum, but they also have added features for durability. Because of their lightweight material, these shoes are a good choice for players on clay courts. Additionally, since they have added mid-foot stability, you are less likely to sprain your ankles or injure your knees on a softer court. Although the Prince T22 tennis shoes have a lot going for them, they do tend to run a bit on the small side. Some mid to lower price range shoes fall into this mistake. If you plan on purchasing these shoes, consider going up by half a size. The older version of this shoe, the Price T10, had some ventilation problems. The T22, however, addresses that issue by incorporating more mesh into the upper portion of the shoe. Although the foot bed has a good amount of support and padding, the ankle area is lacking in both areas. Without higher socks, the top of the shoe has a tendency to run on your ankle, causing irritation. Owing to the lack of padding in the ankle area, the T22 tennis shoes do take a bit more breaking in time than the Gel-Resolution 6s do. Once they are broken in, however, you should be able to wear shorter socks again if you want to. Even though the T22 tennis shoe do run on the small side of things, they also have great room in the toe box. While some mesh shoes tend to be a little narrow, these shoes give your toes amble room to spread out during the game. This, of course, also helps with the ventilation. Although the Prince women’s T22 tennis shoes do have a few setbacks, they are still an excellent option. If you play on a soft court, these shoes will provide the support and ventilation to get through long games. Simply go up half a size and allow for some break in time and you should have a great pair of shoes. Unlike the two previous options, the New Balance men’s MC806 stability tennis shoes do not fall into the lightweight category. They do, however, provide excellent support and durability. As these shoes are made from leather and synthetic materials, they are more durable than the other options. Since they are more hardy materials, however, they do take some time to break in. The leather will remain stiff for a couple wears, but it is the more durable option. The toe box on the MC806 Stability tennis shoes is one of the major draws of the shoe. Because it is wide with good ventilation, it prevents toe jams and overheating. Additionally, since it is reinforced, it will hold up to a hard court surface. For player who need extra support, the MC806 Stability tennis shoes also provide a good option. Since they are made partially of leather, they offer a much stiffer support system. While this does cut down on the cushioning aspect, the support will make up for it. 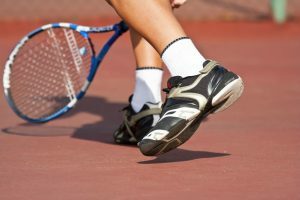 If you are playing on a hard court, however, the shoes will not provide the cushioning you see in other tennis shoes. The tongue and sole of the shoes simply do not have the same padding as other models. For some players, this is not an issue, but it is something to remember. Another potential issue is that the shoe materials, although technically more durable than synthetic only shoes, breaks down in certain areas. If you have a wider foot, the toe box can split. Additionally, the sole of the shoe has a tendency of separating after some use. While the older model of this shoe had some issues with the tongue length and lacing eyelets, the MC806 Stability tennis shoes do address these issues. The tongue is lengthened in this model and the eyelets go up slightly higher for added support around the heel. 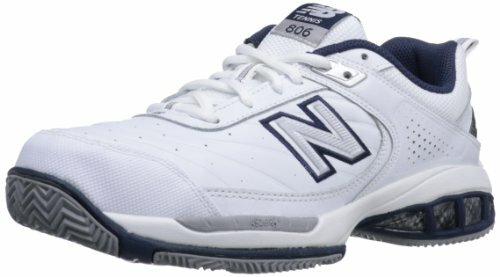 Although the New Balance MC806 Stability tennis shoes do offer a number of great features, they are not for every player. For those with more narrow feet, or those who need a stiffer support system, however, they are an excellent choice. 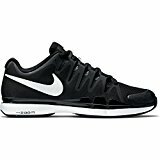 The Nike men’s Zoom Vapor 9.5 tour tennis shoes offer a lightweight option for men while still providing excellent support. Unlike the previous option, they are constructed from lighter materials which makes them well designed for softer court surfaces. Because the Zoom Vapor 9.5 Tour tennis shoes incorporate Adaptive Fit and flex groove, they are designed to fit your foot like a glove. They are also very adjustable so you can have a custom fit shoe at a lower price. In addition to the custom feel, the arch supports and added cushioning at the heel make quick lateral movements comfortable and safe. 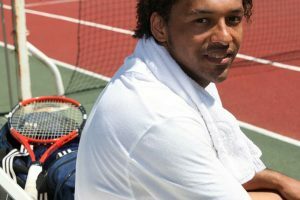 As they are made to fit like a glove, you should not notice them too much when you are moving around the court. While the New Balance shoes are made to be durable on a hard court surface, the Zoom Vapor 9.5 Tour tennis shoes are really made for a softer court. On a clay or grass court, they will hold up well, but the synthetic materials will degrade much faster on a hard court. For some players, the adjustability of the shoes can lead to a sloppier fit. 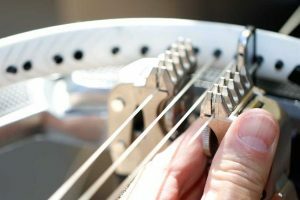 While the customization can be helpful if you need the extra support, it can be difficult to find the perfect balance and therefore lead to a less than ideal fit. 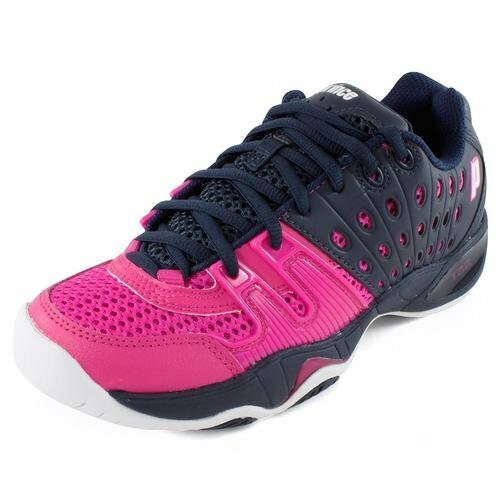 If you are looking for a pair of tennis shoes you can simply slip on and run out onto the court, the Zoom Vapor 9.5 Tour tennis shoes may disappoint you a bit. Because of the adjustability, they do take some time to put on and tighten. 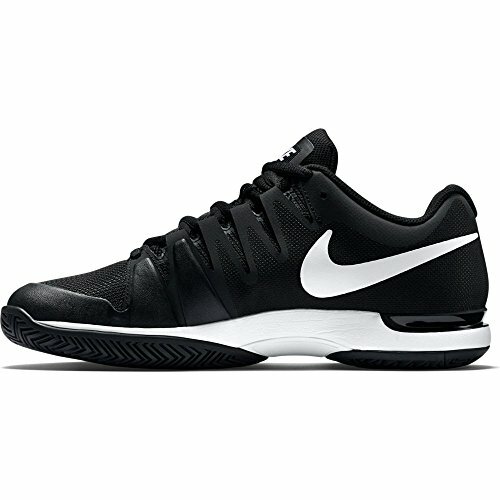 Overall, whereas the previous option provided a good hard court tennis shoe, the Nike men’s Zoom Vapor 9.5 Tour tennis shoes offer a great option for softer courts. If you are looking for a customizable shoe that allows you to dictate the level of support, these are a great option. 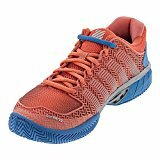 The Adidas Performance men’s Barricade Court 2 tennis shoes are a medium weight tennis shoe that still offers good support. Like the previous option, they are also best for grass and clay courts as they are made from synthetic materials as well. The Barricade Court 2 tennis shoes have great features for fast movement and flexibility. Since they incorporate so many supportive features, they allow your foot to move naturally through a full range of movement. Even though they are made from synthetic materials, these shoes do weigh a bit more than other options. This fact is owing to the extra supportive padding throughout the foot bed. If you are looking for a more substantial soft court shoe, these are a good option. 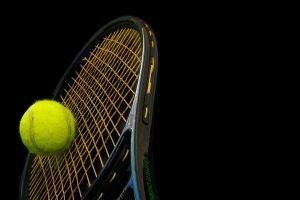 While most synthetic material tennis shoes advertises their highly supportive foot bed, the Barricade Court 2 tennis shoes have a noticeable amount of support. For players with higher arches or simply feet in need of more support, these are a good option with their molded insoles. Because these shoes are made from softer synthetic materials and mesh, they do not hold up as well on hard court surfaces. 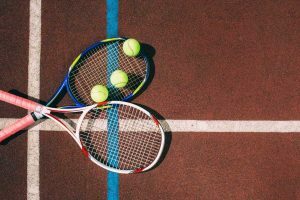 If you intend to play primarily on hard court surfaces, the Barricade Court 2 tennis shoes may not be the best option for your needs. Although the Barricade Court 2 tennis shoes boast great support, for some players the foot bed is too hard. Additionally, depending on your foot structure, the heel may be too high in comparison to the arch of the foot bed, causing some discomfort. Unlike many alternatives, the Barricade Court 2 tennis shoes have the status of being comfortable out of the box, provided they are the correct shape for your foot. Since they do have molded support, there is not as much of a breaking in period when they are molding to your feet.